Join Stephen F. Austin State University's Swingin' Axes and Swingin' Aces jazz bands for a thrilling evening of jazz and fun at the Fredonia Brewery on Friday, March 2, starting at 6 p.m.
NACOGDOCHES, Texas - Join Stephen F. Austin State University's Swingin' Axes and Swingin' Aces jazz bands for a thrilling evening of jazz and fun at the Fredonia Brewery on Friday, March 2, starting at 6 p.m.
From 6:30 to 8 p.m., hear music composed and arranged by the late Darrell Holt, a nationally recognized jazz arranger/composer and a former director of the Swingin' Axes. The Swingin' Aces, directed by Dr. J.D. Salas, associate professor of tuba and euphonium studies, will open the set followed by the Swingin' Axes. "The weather will be beautiful for dancing under the stars. Sit at provided picnic tables or bring your own folding chairs and get comfortable," said Dr. Deb Scott, professor of trombone in the SFA School of Music and director of the Axes. Then, from 8 to 9 p.m., listen to SFA jazz combos as they perform a wide variety of jazz styles. "The small group jazz setting has really allowed the students to be innovative. They are composing and arranging some beautiful music that they are eager to perform," Scott added. At 9 p.m., the Axes will return to the stage to play some funk and rock favorites by Michael Jackson, Al Jarreau and many more. The Fredonia Brewery will serve beer and other beverages produced at its downtown Nacogdoches facility. Eat a Bite Food Truck will also be on site with sandwiches, burgers and other American fare for purchase. 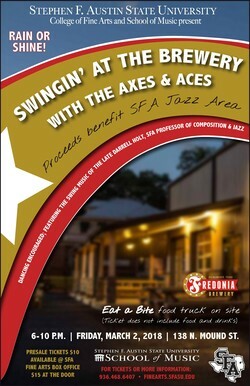 Proceeds will benefit the jazz area in the SFA School of Music. The Fredonia Brewery is located at 138 N. Mound St. Rain or shine, the event will be dry with a tent set up on site. Tickets at the door are $15. Pre-sale tickets are $10 and are available at the SFA Fine Arts Box Office, by calling (936) 468-6407 or by visiting http://www.finearts.sfasu.edu/. Ticket prices do not include cost of food or beverages.